Edward D. Wood Jr; Rudolph Grey; Bela Lugosi Edward D. Wood Jr Book and Video Set: Containing "Plan 9 From Outer Space" and "Nightmare of Ecstasy"
Edward D. Wood Jr Book and Video Set: Containing "Plan 9 From Outer Space" and "Nightmare of Ecstasy"
A pack consisting of a video-cassette of the film, "Plan 9 From Outer Space", and a book which tells the story of its creator, Edward D. Wood Jr, dubbed "the worst director of all time" for his low-budget cult films. The tale is told by his colleagues - a motley crew of deadbeats and losers. Grey, Rudolph, Wood Jr, Edward D.
2. 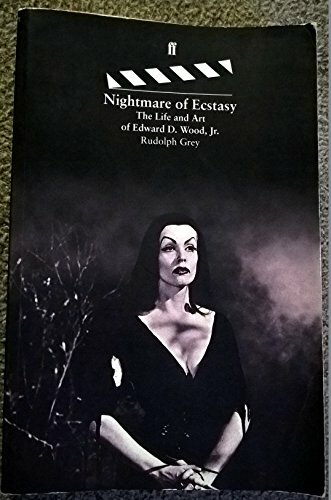 Edward D. Wood Jr Book and Video Set: Containing "Plan 9 From Outer Space" and "Nightmare of Ecstasy"
3. Edward D. Wood Jr Book and Video Set: Containing "Plan 9 From Outer Space" and "Nightmare of Ecstasy"